The only thing I enjoy more than beans is spicy beans, and that's what I recently made for our office potluck. I always like to take something I know I'll enjoy just in case everything else being offered can also be found on a supermarket shelf (which is sadly what happens more often than not). This recipe from Susan of Food Blogga caught my eye when she posted it almost a year ago, and I finally got around to trying it myself. With a few personalizing tweaks, it was everything I hoped it would be. I used my homemade barbecue sauce and I added waaaaay more cilantro, tomatoes, and some jalapenos for extra heat. The result is a bright, fresh, filling, and fiery mix of flavors and textures, and I loved it. Saute the corn until lightly browned, about 3-4 minutes. Remove from heat, and add to a large bowl. Add the green and jalapeno peppers, rinsed beans, drained tomatoes, and barbecue sauce; stir until well combined. Gently stir in the cilantro. Adjust seasonings if necessary. Serve at room temperature or slightly chilled, though it tastes better if it's allowed to marinate for at least a couple of hours. My guess is that your homemade BBQ sauce is what made it SO tasty. Hope the office folk enjoyed it! Looks real tasty Grace I love spicy beans too yum. These beans look delicious. 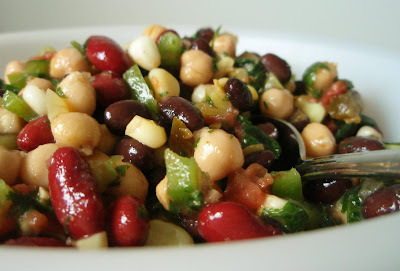 I love a good home made bean salad, and this one has a fantastic, spicy twist to it! I love all the colors, and the mix sounds delicious! I have (a whole lot of) black beans soaking now, so many bean dishes will be in my near future, and this should be one of them. I have to say the array of colors caught my attention first, and the BBQ sauce is a unique difference for bean salad .. definitely a summer treat I will try! Those look really good. I'll definitely have to give these a try- I love pickled jalapenos! Oh what a great summer side dish! MMM beans! Don't you hate when everyone else at a potluck just buys the food they bring. Mmm that looks so good and I have the sneaking suspicion that this is good for me? Sold! Delicioso! What a great side dish to take to a potluck! I'll have to take this to my next neighborhood barbeque. Love this! It looks beautiful and is a perfect (and healthy) Summer side dish. What a great salad for summer and it's healthy too! Love it! This looks delicious. And definitely something Greg could have, considering he has diabetes. Thanks for that recipe you sent, by the way - oh YUM! Do you have any other diabetic friendly recipes to share? Ooo this sounds good and I don't even love beans! I'm imagining scooping it up with corn chips mmm. Grace, these beans sound perfect with the addition of your BBQ sauce! Major YUM! I imagine your fellow workers really enjoyed a homemade dish! As a French gal, you did right. There are beaucoup de beans and it's very délicieux! If I ever come to NY, I'm going to come over and gobble up everything on this blog. Mmmm, the kids and I love beans. My love for them is new found the kids have been fans from the get go. mmm beans. :) I'm loving it already. Sounds like a great dish to take to work. I used to do that too. Always made me feel good when my dish disappeared first. this sounds awesome, and such a pretty dish too. Hey we both know the same amount of French, imagine that! I am bookmarking this. I will of course make no tweaks. I am pretty much tweakless. omg have you tried raw corn kernels though? they're fab. Mmmm this looks wonderful, I love beans. I made a sweet potato hash tonight with black beans and was so happy with how the beans came out (Rancho Gordo), I was thinking I need more bean dishes. This could be it! It's always disappointing when people bring in the vat food from the big chain grocery store for a potluck... Your spicy bean salad looks delicious! As one fellow bean lover to another, all I have to say is beaucoup yum! Susan has a lot of lovely recipes! I love a good bean dish, although I would leave out the cilantro, the rest sounds delicious! It's cool you take the time to make something tasty for your coworkers. I love all kinds of beans in all sort of variations! this recipe looks so delicious, Grace! Well you know I'm crazy over dishes like this and yes, yes, yes, on more cilantro. Adding the BBQ sauce is sheer genius. (I'd have to switch out the kidney beans tho -- they make my toes curl -- and I don't say that about too many things.) I could hunker down and eat the whole bowl. Beans! Magical beans! They're so good for you and delicious. I bet everyone gobbled this up. Very nice recipe you got here. I bet everyone loved it. This is so much better than regular three bean salad anyday! I love bean salad, and your version sounds awesome! It would be perfect for a barbeque. Bean salad is perfect for summer. It is very nutritious and nourishing. Yours look superb! What a tasty and healthy salad - I love that it has a kick. Good use of that barbecue sauce. Looks like a fantastic summer salad! Grace, I love everything about this dish: one of your few savory dishes, it's colourful, it's healthy, it's timely for BBQ/backyards, it's from another cool blogger (Susan) and there's BBQ sauce in it. A must try. What a great combination of beans. I'm a southerner also and I lived in the NE for a while and with my southern drawl, I definitely stuck out. Do you know the plural of y'all? It's all y'all. A great way to finish off that remaining home-made BBQ sauce.